This page has been seen 1,544 times. 2014 saw the introduction of 2-wire 2-channel LED sets with a MultiFunction controller (MFC). These are still “2 channel” in the sense that the included controller can independently light up one set of LEDs or the other. What differentiates these from conventional multifunction LED strings is that earlier strings had 3 or more wires. For 3-wire; a common +ve wire and a separate -ve wire for each of the 2 channels. 2 wire 2 channel LED strings come in a number of forms, fairy lights, icicle lights and rope lights are among the variants. They are recognisable by the fact that there is a multifunction controller (MFC) with only 2 wires leaving it to connect to the LEDS. The MFC is often incorporated into a plugpack that plugs directly into a mains outlet. These light strings do not work properly with conventional DC controllers as only every second LED will light up. 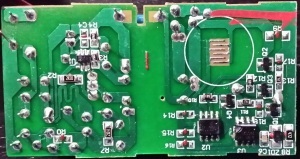 This is the top side of the PSU / MFC combo PCB. It uses a tiny switch-mode power supply to provide an isolated 31V DC. 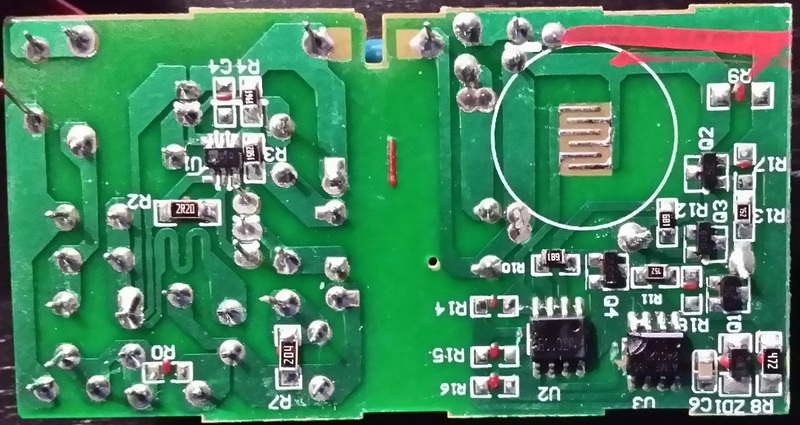 This is the bottom side of the PSU / MFC combo PCB. There’s a good amount of clearance between the mains and ELV sides. The IC on the right is an Atmel 24C02B EEPROM, which most likely has the pattern data. The one on its left is marked JT010B which would be a small microcontroller. Here’s a schematic of a MFC output driver. 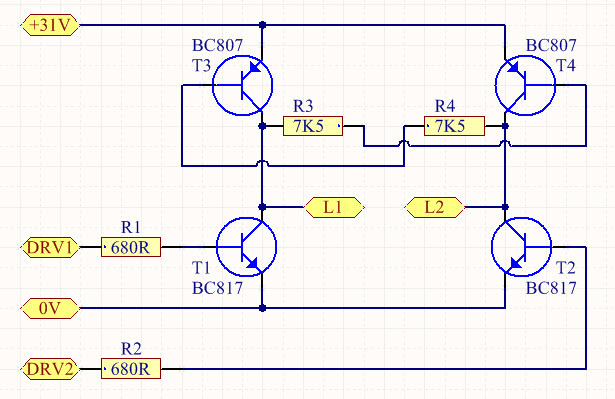 It’s a discrete H-bridge employing bipolar transistors. 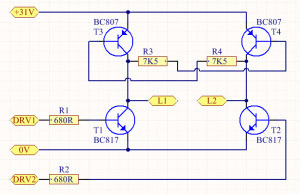 L1 and L2 are the output to the 2-wire LED string. DRV1 and DRV2 are fed from the microcontroller. AusChristmasLighting member @koolantz (Anthony) put his oscilloscope on the output of the controller to show the waveform. The 2-wire LED strings seem to be available in a couple of different versions. This one uses bi-colour LEDs. All LEDs light up one colour when power is applied one way and a different colour when power is applied with reversed polarity. For example, the string may alternate between all white and multicolour (red, blue, green, yellow). The wiring on this string is not confirmed, only guessed based on the 2nd version below. This one uses regular LEDs. Every other LED lights up when power is applied one way and the other LEDs light up when power is applied with reversed polarity. I could not find any current limiting resistors in this string. Since all 10 sections are wired in series, you can’t cut them up and still use them on the same voltage. Thanks to David Duffy/David_AVD and https://www.da-share.com/circuits/2-wire-led-strings/ for much of this information.